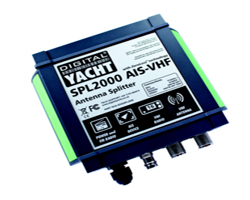 The SPL2000 VHF-AIS antenna splitter is compatible with both AIS transponders and receivers and uses the main VHF antenna for both VHF and AIS transmissions. This reduces the need for additional antennas to have receive AIS and VHF data. In the SPL2000, a fail-safe function is built in so that the main VHF operation will not be affected if the SPL2000 loses power. Digital Yacht’s patented ZeroLoss technology has been used to ensure good AIS and VHF reception and transmission signals. This solution is waterproof and has shown to be easy to install on boats, whilst maintaining the high performance Digital Yacht products have typically provided. For your benefit, there are 3 LED lights to show when the unit is powered up and when the AIS or VHF transmits. Digital Yacht is about advanced navigation, communication and entertainment systems for your yacht at an affordable price. We seek to create a pleasant and worry-free yachting experience by integrating your existing legacy systems with our advanced marine electronics. Our products are being sold in over 100 countries worldwide. Internet access is made accessible along with navigational aids that will ensure you will never lose your bearings in the middle of the sea. Our PC and software solutions solve all your marine electronic requirements from communication to navigation to entertainment to monitoring. Our technology encompasses specialist positioning and heading sensors, AIS Class A and B and receivers, NMEA networking, wireless navigation and communication and on board networks and control systems.